• Even if Trump Loses, He Wins? Since former DHS Secretary Kirstjen Nielsen was compelled to resign on Sunday, certain pieces of the puzzle have been made clear. Border apprehensions are way up, Donald Trump is unhappy about it, and this has created an opening for the ultra-nativist Stephen Miller to exert his influence. On Thursday, what is probably the biggest missing piece of the puzzle fell into place. The policy that Miller wanted to implement, which the DHS would not do because they deemed it to be illegal, was to take the undocumented immigrant detainees for whom there is no jail space, put them on buses, and dump them in "sanctuary cities" in order to punish those cities for their failure to support the administration. Surely it is no surprise that Trump loved the idea. And if there's any policy that embodies the worst instincts of his administration, this has to be it. In one package, we have disregard for the rule of law, abuse of power, dehumanizing treatment of immigrants, and the view that any Americans who oppose Trump are the enemy. In case there was any question on the latter point, DHS officials confirmed off the record that Miller and Trump specifically wanted to make sure that some buses were routed to the home district of Speaker Nancy Pelosi (D-CA). After this news broke on Thursday, Pelosi spokeswoman Ashley Etienne blasted the administration: "The extent of this administration's cynicism and cruelty cannot be overstated. Using human beings—including little children—as pawns in their warped game to perpetuate fear and demonize immigrants is despicable." Late Wednesday night/early Thursday morning, Wikileaks' founder Julian Assange's time on the lam came to an end, as he was arrested in London. The Ecuadorean government, which hosted him for seven years in its embassy, grew weary of his shenanigans and withdrew the asylum it was providing. So, in went the bobbies, and out went Assange. Assange, of course, is a connector between Russia and the Trump campaign. Since we don't have the Mueller report, we don't know exactly how much the Special Counsel uncovered on this front, but surely it is not the whole story. It's not likely that the Dept. of Justice will pick up the ball with AG William Barr in charge, but it's dollars to doughnuts that one or more House committees are going to want to hear from him. Assange is going to be in British custody for quite a while, but a visit to the United States can surely be worked out with them. Herman Cain isn't the only less-than-stellar candidate for high office to be getting pushback from Senate Republicans right now. Majority Leader Mitch McConnell (R-KY), who is getting an earful from the members of his caucus, publicly warned Donald Trump not to pick former Virginia Attorney General Ken Cuccinelli to be Kirstjen Nielsen's replacement as DHS secretary. Part of the problem is that DHS is acquiring something of a reputation as a bureau that is less focused on national security, and more focused on serving as the Trump administration's Blackshirts. The other problem is that Cuccinelli has a reputation for being a bit fanatical in his anti-immigrant politics, and for being willing to play fast and loose with the Constitution. He wants to revoke birthright citizenship, for example, and is an advocate of denying unemployment benefits to people fired because they cannot speak English. Add it all up, and McConnell & Co. see nothing but headaches from a hypothetical Secretary Cuccinelli: PR nightmares at best, and lawsuits and potential criminal charges at worst. Even if Trump Loses, He Wins? It's not just Congressional Republicans who might be contemplating a world in which Trump loses the 2020 presidential election. Some of the President's biggest fans are apparently contemplating it, too. Specifically, Fox News host Tucker Carlson, who is VP of the Trump Fan Club (and runs the meetings when President Sean Hannity can't be present), has been using his show this week to float the idea that maybe the President is trying to lose the 2020 election so that he's not cooped up in the White House throughout his 70s. Greg Craig served as White House counsel for both Barack Obama and Bill Clinton, most notably directing the latter's impeachment defense. Now, Craig is going to have to mount a defense for himself, as he has been indicted for violating the Foreign Agents Registration Act by not disclosing his work for Ukraine and then lying to the Department of Justice about it. This is the same thing that got former Trump campaign chair Paul Manafort into trouble, and indeed, it was Manafort who made the first introductions between Ukraine and Craig's firm, and it was special counsel Robert Mueller who set the Dept. of Justice on Craig's tracks. 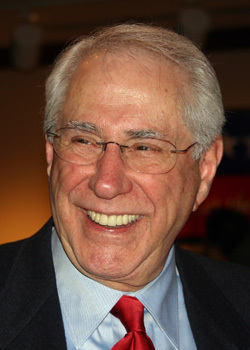 We thought that we'd gotten to everyone who might plausibly declare a presidential run this year, but then Mike Gravel surprised everyone, as he is wont to do. Since he has no intention of winning, and only wants to get on the debate stage, the pros and cons below will be the pros and cons of giving him a debate slot, and not his pros and cons as a hypothetical Democratic nominee. Background: Born to Canadian immigrant parents, Gravel grew up in Massachusetts. He was a poor student, likely due to undiagnosed dyslexia, and had to repeat third grade. He eventually got help from several sympathetic educators, and even started college before deciding to volunteer for service in the Korean War. He served in the Counterintelligence Corps, and ultimately ended up in Paris, where his job was to infiltrate French communist rallies and report back to superiors. Following his discharge, Gravel finished his degree at Columbia University, taking a B.S. in economics. After trying his hand at several different careers in New York, without much success, he decided to start fresh as "a pioneer in a faraway place." That place ended up being Alaska, which is indeed faraway from New York. It also had the benefit of being sparsely populated, especially back then (1956), which made a near-lifelong dream of a career in politics more realistic. Political Experience: Gravel tooled around in the real estate business when he arrived in Alaska, but he was merely biding his time until the start of his political career. He got involved in the Democratic Central Committee for the Alaska Territory, and became president of the Alaska Young Democrats. He failed in a run for the territorial legislature, then failed in a run for the Anchorage city council, and finally won in his third attempt at office, securing a seat in the Alaska House of Representatives. He served there for four years, including the last two as Speaker of the House. That was followed by an unsuccessful run for Alaska's sole seat in the U.S. House of Representatives, and then a successful run for the U.S. Senate in 1968. His main theme in that campaign, waged against 81-year-old incumbent Ernest Gruening, was "I'm not old." That probably won't work in his current campaign. Gravel spent two terms in the Senate, bringing home lots of pork for Alaska, but also stepping on the toes of pretty much all of his colleagues (most famously when he insisted on reading the Pentagon Papers into the record). He was defeated in the primaries in 1980 by Clark Gruening, the grandson of the senator that he had sent into retirement in 1968. Gruening, in turn, lost to Frank Murkowski, father of current Alaska senator Lisa Murkowski. Clearly, politics is a family business in Alaska. In any event, after leaving the Senate, Gravel has never again held office, though he did get involved in a number of activist causes, like leading an unsuccessful push to allow ballot initiatives at the state level. You wouldn't think an avant garde political ad was possible, but there it is. It's certainly a change from the early years of his political career, when he was in the habit of giving speeches while dressed as Paul Revere. Instructive Quote: "We have become a nation ruled by fear. Since the end of the Second World War, various political leaders have fostered fear in the American people—fear of communism, fear of terrorism, fear of immigrants, fear of people based on race and religion, fear of gays and lesbians in love who just want to get married and fear of people who are somehow different. It is fear that allows political leaders to manipulate us all and distort our national priorities." Completely Trivial Fact: Gravel, if he were to be elected, would be the first U.S. president of French-Canadian (or, for that matter, French) descent, and the second U.S. president to have something other than English as his first language. Gravel spoke only French until he was 7; the same is true of Martin Van Buren and Dutch. Recent News: Gravel's surprise campaign announcement was his biggest news of the week, but we already wrote about that. So, we will instead note that he inspired paroxysms of glee when he refused to appear on Tucker Carlson's show, and then sent out a fundraising e-mail with the subject "F*ck Tucker Carlson." Three Biggest Pros (of him getting to debate): (1) The debates are kind of dry, and they would be much less so with him there; (2) There's something to be said for upending the status quo; and (3) He could get the Party and the country talking about an issue or two that is not currently on the radar, as Sen. Bernie Sanders (I-VT) did with the $15/hour minimum wage in 2016. Three Biggest Cons (of him getting to debate): (1) Having a nonserious candidate on stage makes the Democrats look like a nonserious party; (2) Time is going to be precious, and every minute that Gravel uses up is one less minute for the candidates who will be getting (and who need) their first national vetting; and (3) If the post-debate discussion is about Gravel's crazy behavior, as opposed to which person would be the best candidate, that is good for neither the Party or the process. Is He Actually Running? : Yes, he is. Betting Odds: No odds are being offered. The Bottom Line: Of course he's not going to get the nomination. On the other hand, you know who else launched a presidential campaign that wasn't meant to be successful, and was thus empowered to say whatever damn thing came into his head? Donald Trump. So, you never can tell.